am a keen photographer, artist, dabbler-with-writing and traveller. I hope these pages will accurately reflect these interests. I’m taking Sebastian Michael’s AWAKE course. I am continually learning new things about Photoshop Elements. I am starting to learn Photoshop as well as improving my photo editing skills. Iphone photography is my latest interest – another huge learning curve. Now that I’m something of a nomad I’ve had to turn my attention from the creation of mixed media pieces – unfortunately I can’t carry my complete stash around with me – towards more portable media so I’ve turned to photography, digital art and digital scrapbooking in order to feed my creative soul. As if all this wasn’t enough I try to challenge myself on a regular basis by participating in various online challenges. I’m based in Luxembourg, the “green heart” of Europe, a good jumping-off place for visiting other parts of Europe as it’s bordered by France, Germany, Belgium and Holland. I also travel widely in Asia when I get the chance. If anyone would like any information regarding visiting Luxembourg or anywhere else nearby, please drop me a line and I’ll be happy to help if I can. This whole blogger is a work of art. It is simply magnificent Carol. I am so proud of you. Bravo! Thank you Fran and Heather. I am delighted that you have enjoyed your visits and will come back often. I look forward to coming back often and salivate at the wonderful places you travel, I do miss travelling, at least I can come with you through your work, thanks for that. (: hi I have joined the cruise too (: hope all is well for you. This blog is filled with so many great ideas. Thanks for taking the time and effort and sharing your creativity with us. Hi, thank you for entering my OWOH giveaway. I hope you’ll be back to visit my blog soon! I strive to think of something new to say that will convey how much I love reading your posts. You are an amazing lady! thanks for stopping by my blog; it made me find yours! Wow looks very intruiging; I’m subscribing and will come back to delve deeper soon. Crazy that, my round robin journal is about journeys, both real and metaphysical… certainly on the same wavelength, huh? 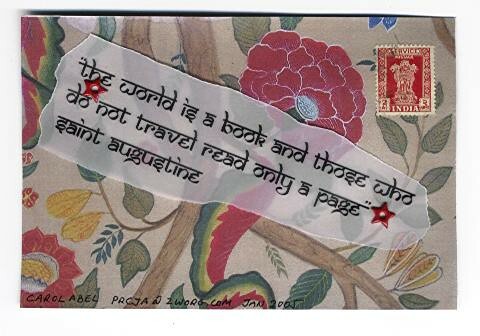 Still, I can read others adventures…. It sounds like your life is filled with creativity and that’s always a very satisfying place to be! 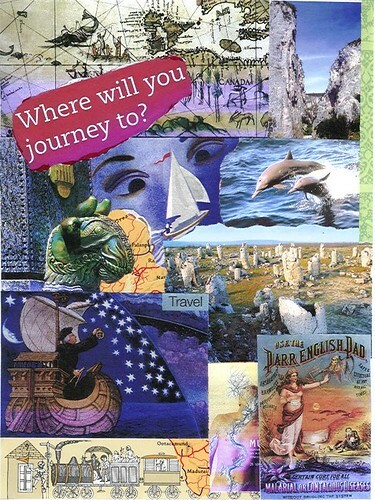 I also love to write…I love your journey collage! Lovely! Wow! Thanks for your note about Winnie the Pooh on my blog…otherwise it might have taken me just a little longer to find yours, and I know I’m going to love it here! I would love to take one of Kim’s online classes too someday. I bet you are learning lots of new things! I was interested in your link to Heather Blakely’s site but when I went there, it was so confusing, too many links, that I decided to come back here and check in with you. Is the Soul Cafe still open for newcomers or are they closed? If they are still open, how do you join? Thanks for any hints. Hello Carol I don’t know quite how you seem to have slipped through and out the other side of my blog and I haven’t been a visiting *sorry…. my loss so far . Lovely work… here so varied and JUST BRILLIANT ! You’re going to laugh at this, but I am still using my beloved Photoshop Elements 2. I bought the 3 when it came out and didn’t like it, so I simply stayed with 2 all these years. That’s me old Miss Sticky. But honestly Photoshop Elements 2 is so close to Photoshop 7 (the best one ever btw) that you can’t tell a difference unless you are doing some very high-end work. thank you. I hope you will enjoy exploring my blog. The Thoreau quote is one I had written down in January and have been thinking about a lot the past few days, so when I saw the title of your blog, I jumped and immediately looked at your blog. I’m an avid collector of quotes and this is the one that spoke loudest to me too. You have a beautiful blog. Can’t wait to explore more. Thank you. Bon voyage throughout my blog.